Shree Mangalchandika Prapatti is one of the most significant opportunities presented for the Shraddhavan women. A woman who performs the Prapatti of Adimata Chandika becomes capable of protecting herself, her family, society and country. Also, the spiritual strength that she obtains from the Prapatti makes her able to set forth the development of her family, society, country and religion. The aforementioned is a summary of the conclusion made by Sadguru Shree Aniruddha in one of his discourses while speaking upon the importance of the Prapatti to be performed by women. 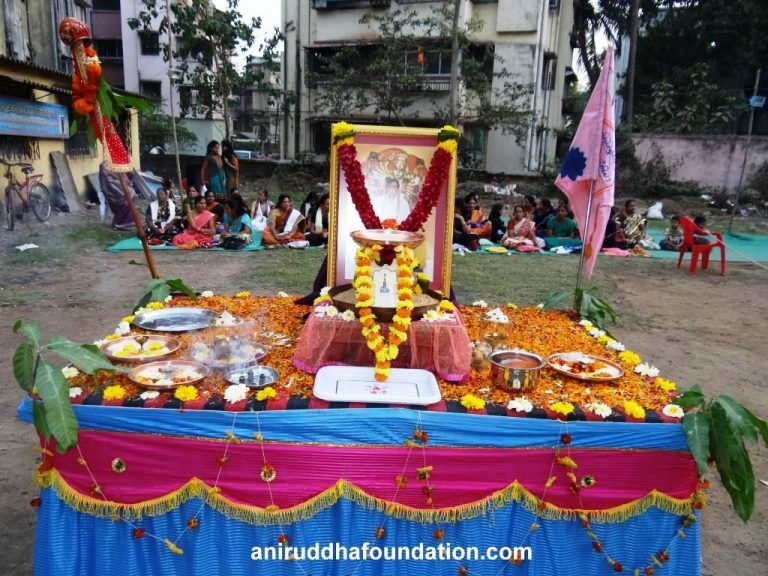 Sadguru Shree Aniruddha announced about Shree Mangalchandika Prapatti for women, in an important discourse that introduced us to the concept of the Ramrajya. Shree Mangalchandika Prapatti makes a woman puissant. If the word Prapatti was to be defined, it could very well be called as such submission that enables one to avert adversities. The Mangalchandika Prapatti is offered at the feet of the Parmatma’s mother, Adimata Chandika. Women celebrate the Prapatti on the day of Makar Sankranti, which either falls on 14th or 15th of January. As it was on this day that Adimata Mahishasurmardini stepped foot on Earth for the first time at Katraj Ashram of sage Kardam and Devhuti, to kill Mahishasur. Hence, on the day of Sankranti, Shree Mangalchandika Prapati is performed after sunset. Why so? As it was after the sunset that Mahishasurmardini set forth her first step onto the Katraj ashram. It would have been impossible for humans to bear the effulgence of Mahishasurmardini if she would have arrived while the sun was still out. Hence, she took her first step on Earth only after sunset. 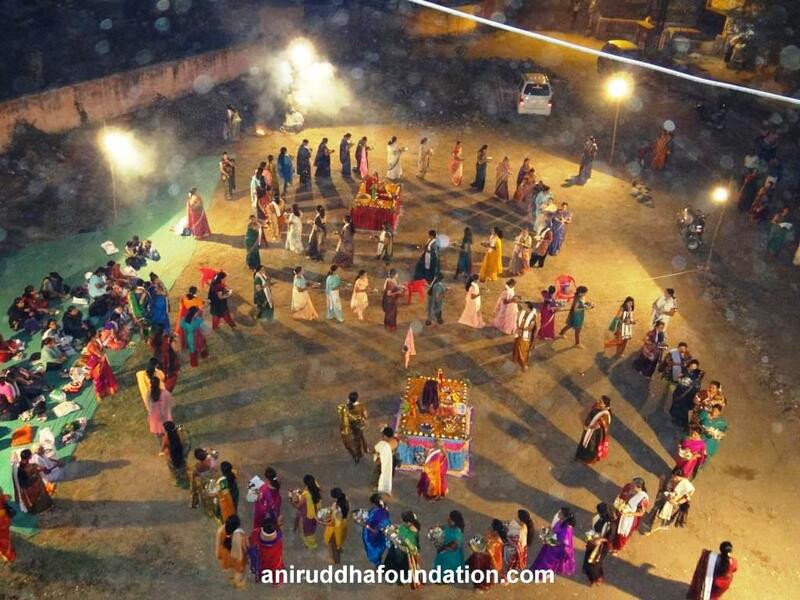 On the day of Sankranti post-sunset, women may come together in an open area to perform the Prapatti. The observance of Prapatti enables every woman in any role whether a mother, a wife or a sister, to obtain the inner strength for becoming a protective soldier or in fact, the guard for her family. She assumes such a role after the completion of the Prapatti. The Prapatti should ordinarily be performed in an open area, such as a seashore or riverside, on open ground, in a balcony, or in the area against the railings in chawls. The greater the number of women perform Prapatti, the better it is. Any woman above the age of 16, may perform the poojan. If a woman performs the Prapatti for one year, it does not make it mandatory for her to carry it out every year. Moreover, Bapu has said that even if a woman is on her periods, she may apply the Udi on her tongue or belly button and perform the Prapati. Take a paraat (plate with raised edges) and place it on a chaurang or paat (Indian traditional wooden stool). Put whole wheat grains in the paraat and place a kalash (small metal pot) in it. Add rice grains in the kalash and place a tamhan (a small metal plate) over it. Make two footprints of the Mother Chandika in the tamhan. The right footprint should be made from kumkum while the left of turmeric. Place a picture of Swayambhagwan Trivikram in the paraat, resting against the kalash. This is the arrangement required for the pooja. Women need to bring along a plate (tabak) and the material required for pooja at the venue. 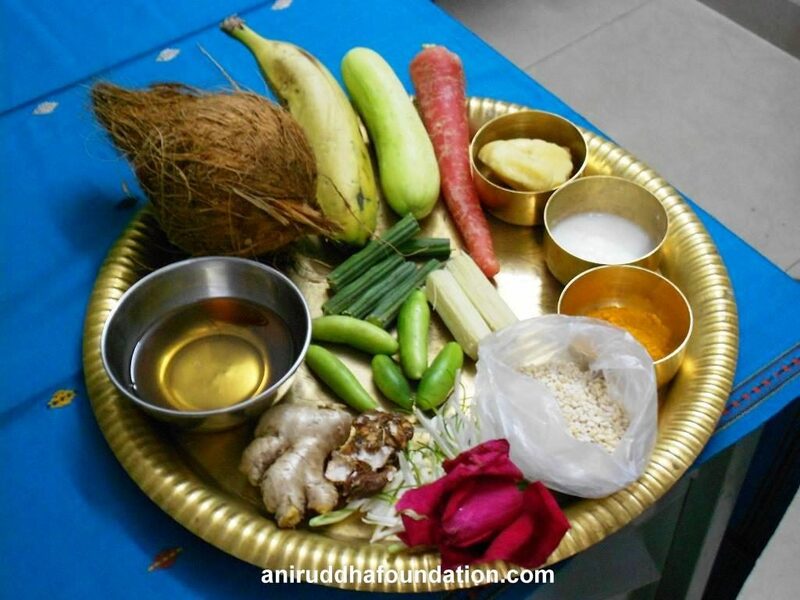 The poojan material includes drumsticks, bananas, cucumber or bottlegourd, a coconut, carrots, radish or ivygourd, urad dal, sesame oil, curd, powdered turmeric (not whole), ginger, jaggery, tamarind, sugarcane pieces, fragrant flowers and the abhicharnashak purchundi. For making this bundle, take a beetle leaf and place salt, mustard seeds and camphor over it and then enclose the leaf by tying it with a thread. Women may stand at the Prapatti staging area holding a plate filled with the pooja material in their hands. The eldest woman amongst them is to perform the Mata Mahishasurmardini aarti, “Maate Gayatri, Sinharudh Bhagawati-Mahishasurmardini, Kshamasva Chandike, Jai Durge, Akhil Vishwaki Janani Maa Ude Ude Ude Ude Ude.” The other women present here will then follow by singing the aarti. Later, the Shraddhavan women circumambulate nine times in a circle around Mother Chandika’s footprints with their plates considering the place to be the Katraj Ashram. They are to chant Shree Gurukshetram Mantra loudly during the circumambulation. After its completion, women perform a ritual over Trivikram (usually done to dispel any evil upon one) with the help of the abhicharnashak purchundi. While doing so, women pray to Trivikram saying, “I urge you to obliterate all the evil influences present in my home with the help of your Mother!”. The bundle is then offered in the fire generated either in a paraat or a hom kund or a pit on the ground with the help of camphor and samidha (twigs used as the sacred offerings). The fire thus generated is Mahishasurmardini’s radiant aura (tejovalayam). This act passes on the entire responsibility of one’s home to Trivikram. Shree Gurukshetram Mantra causes the fire to transform into the radiant aura. The Shraddhavans hold the faith that the evil influences, evil intellect and evil actions lurking over one’s home are obliterated when they fall into the radiant aura and ensures the welfare of one’s home. After the pooja, all the women must chant the mantra, “Om Aim Hrim Klim Chamundayey Vicche” nine times and offer the akshata (kumkum covered rice grains) on the footprints of Mother Chandika and offer the fragrant flowers to Trivikram. The fire of the radiant aura should is extinguished with neem leaves. The women must not take home the kumkum and turmeric powder forming the footprints of Mother Chandika. Instead, they are advised to apply it to their forehead and/or neck. The bananas offered as prasad should be consumed there itself, and the curd is to be given to the male members of one’s house. If there is no male member in one’s home, then curd is to be offered at the roots of any tree. The women are to take the sugarcane pieces home and consume it themselves by eating some every day. The pooja material remaining in the plate should be utilised to prepare Sambar (a sort of Indian curry) and is to be consumed with rice, roti, etc. by both, the men and women in the house. One may add spices for taste and curry leaves for good health. Albeit, do not make any other vegetable on that day in the house. After the pooja commences, the women may celebrate together in a circle while chanting the gajar, “Jayanti Mangala Kali, Bhadrakali Kapalini”. Since the year 2011, as per the guidance of Bapu, all the Shraddhavan women have been celebrating the Shree Mangalchandika Prapatti with great fervour together on the day of Makar Sankranti. Other women take part in the Prapatti as well along with the Shraddhavan women. The face of every Shraddhavan woman observing the Prapatti on the day of Makar Sankranti emanates satisfaction of having performed the Prapatti for her country and her family. Every year, the count of the women participating in this group event of collective Prapatti has only been increasing.